My sister is pregnant! Yippee! So when I started thinking about cool recycling projects, I tried to think of a project that would make fun (and unusual!) baby gifts. They're surprisingly soft, but I still made Mims try one on to see if it was scratchy against her neck (she said "No, it's not scratching my neck. It feels nice, but don't post a picture of me wearing this!" LOL!!!). I won't, but it WAS pretty hilarious (she's five and it was way too small for her)! I whipped up two of these in about an hour. I think that I could become even more efficient if I was going to make a whole dozen. And with the cost being stash-busting yarn scraps and 18 plastic shopping bags for that dozen bibs, I probably will! I think that these are so cool. I would have used them with Mims, if they had occurred to me 5 (almost 6! Yikes!) years ago. 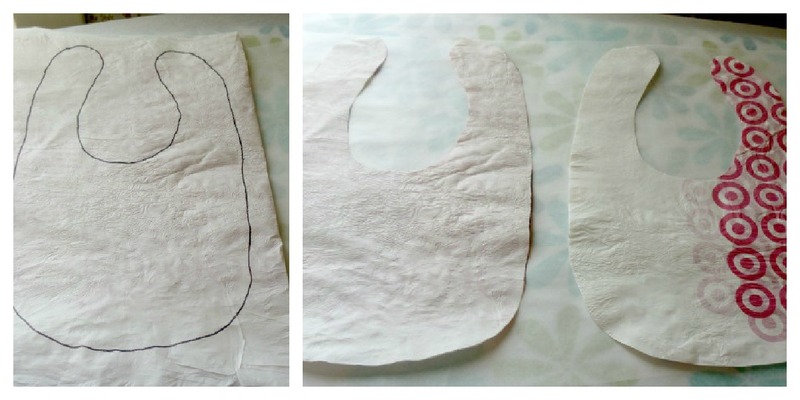 They'll wipe clean, wash with no problems, and when you don't need them anymore, you could totally snip the yarn parts off and recycle them with your other plastic bags. It's kind of amazing. Have I sold you on them yet?! LOL!! Ready to get started? Let's do it!! Lay out your sheet of fused plastic. Center the pre-made baby bib to one side, and trace around it with the sharpie marker (you can put the sharpie and bib away now, we won't need them again). 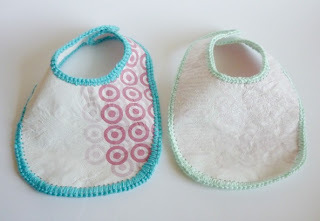 Take the top bib and mark it with the stitch marker by rolling the spikes approximately 1/4" from the edges, all the way around the bib (if desired). You have to use a foam pad under the roller so that the sharp spikes don't get damaged. They sell expensive foam pads that go with the roller, but I just used a cheap sheet of craft foam and it worked just fine. Now use the Wonder Clips and clip the two bibs together so that you can hole punch them at the same time. You can't use straight pins to hold the bibs together, because they'll cause holes that can't be fixed, which is why I love the clips. They work so well! If you think you're going to do a lot of plastic projects you need to get them!!! Punch 1/8" holes around the edges of the bibs. The plastic punches really easily. 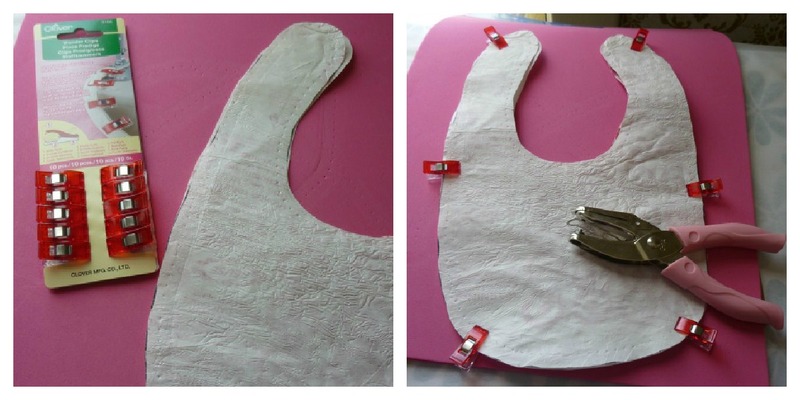 If you haven't marked the bibs, try to keep the holes evenly spaced approximately 1/4" apart. Unclip the bibs. Set one aside, we'll come back to it later. Attach the yarn at one of the back flaps. I used single crochet around the whole bib. Put 2 sc stitches in each hole on a convex edge, and 1 sc stitch in each hole along a straight or concave edge. When you get back to where you started, sl st to the first sc to close the round. Fasten off. Weave in the ends. Cut a piece of velcro (both soft and scratchy sides) 1 1/2" long. 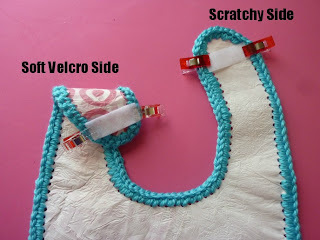 Clip the scratchy side to the flap that will face away from the baby's neck. 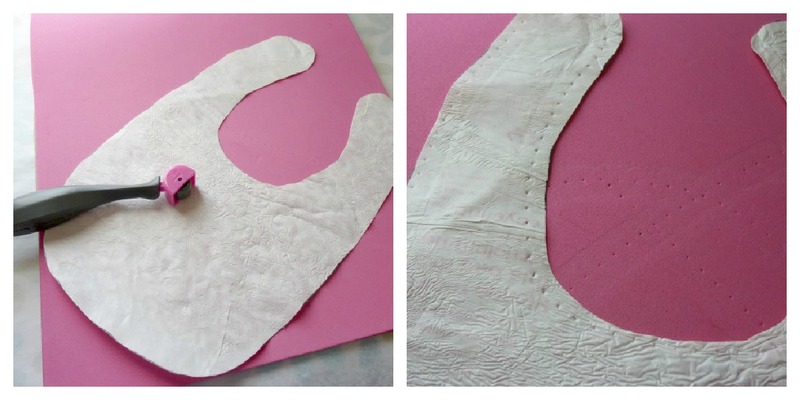 Clip the soft side to the flap that might rub against the baby's neck as you put the bib on him/her. 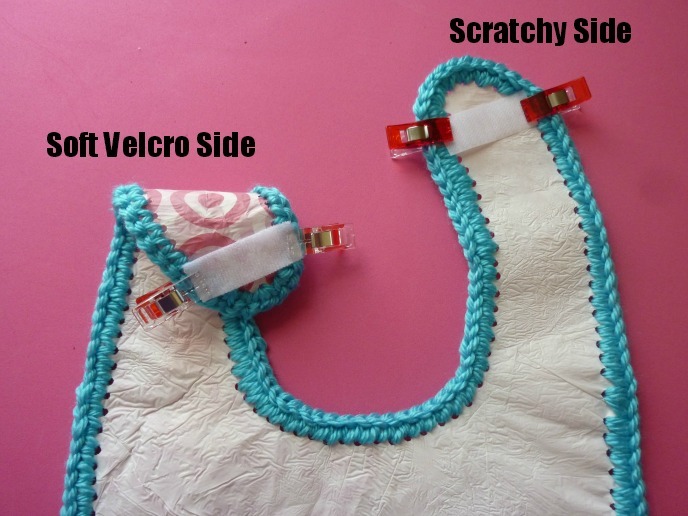 Using a zig-zag stitch on your sewing machine (or a running stitch, if you're hand sewing) stitch both sides of the velcro to the flaps of the bib. Trim all extra threads. 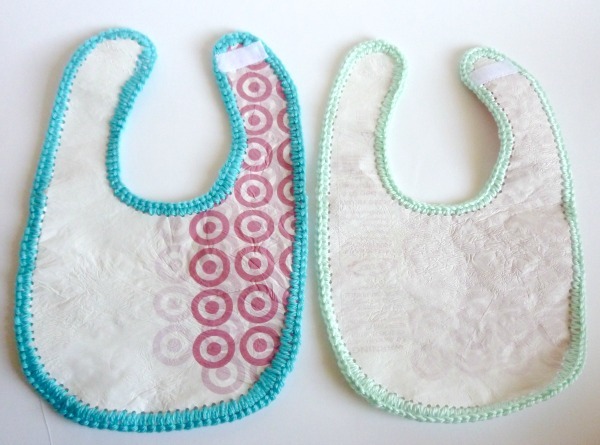 You've now got an awesome recycled bib! 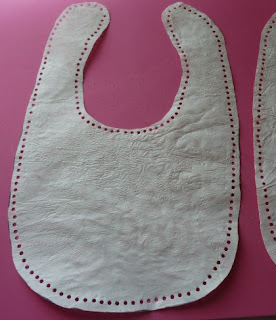 Make another one out of the punched bib you set aside earlier! Pretty cool, right?! Now give them to a baby you love! Want to see more cool fused plastic projects? Check out the links at the bottom of THIS post. very nice baby bib i like it wonderfull good job. OMG!!! I just found this via AllFreeCrochet and a bunch of links. 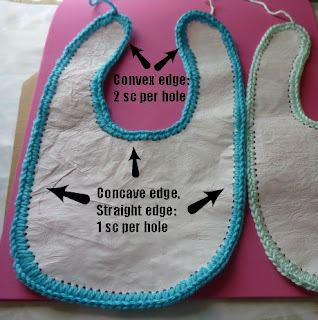 This baby bib idea is GREAT!!!! I am expecting my first grandbaby in less than a month and these are wonderful! You betcha I'm making a load of these! Thanks ever so much for sharing such an inspired idea! This is incredible! 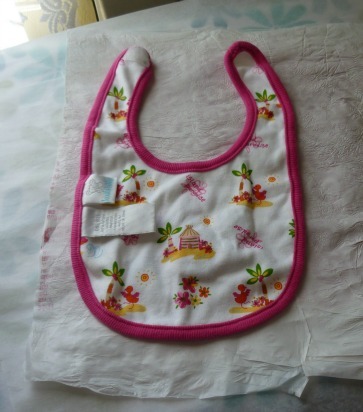 I haven't seen any bibs like this one before. I am very amazed by these bibs and for me, they are really unique. Nice Job!